Her Honor: Rosalie Wahl and the Minnesota Women’s Movement, by Lori Sturdevant. St. Paul, MN : Minnesota Historical Society Press, 2014. MNHS call number: KF373.W26 S78 2014, also available for purchase. This archival collection (1958-1998) contains personal papers from the judicial chambers of Rosalie Wahl. Included are biographical information; speeches and writings; files regarding her Supreme Court appointment, elections, opinions, and committee work; subject files; and materials related to legal education. Rosalie E. Wahl, discusses her family background, career in the field of law, the judicial process, work, and memorable cases on the Supreme Court. The Wahl interview was also recorded on VHS videotapes that are cataloged as part of the Rosalie Wahl Papers.Six 60-minute cassettes and four 90-minute cassettes. 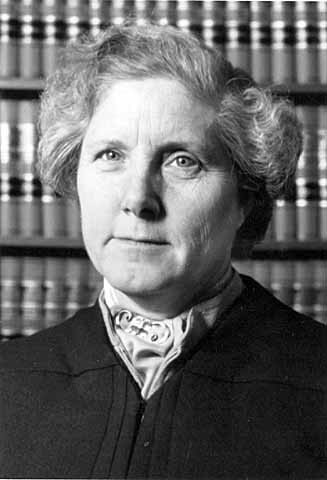 The Social Justice, Legal and Judicial Career of Rosalie Erwin Wahl, complied by the staff of the Minnesota State Law Library; Marvin Roger Anderson, editor; Susan K. Larson, assistant editor. St. Paul, Minn.: Minnesota State Law Library, 2000. Rosalie Wahl was born Sara Rosalie Ervin on August 27, 1924, in Gordon, Kansas. Growing up in the Depression era, Wahl experienced tremendous personal hardship that forever changed her life. In 1949, Wahl, along with her husband and children, moved to Minnesota to live within an intentional community. The community never took off and the family soon took permanent residence in Lake Elmo, Minnesota. In 1962, at the age of 38 and "tired of sitting outside doors waiting for the men inside to make the decisions," Wahl entered the William Mitchell School of Law. After graduation, she immediately began to work for the state as an assistant public defender. In 1973, she accepted a professorship at William Mitchell where she directed the Clinical Legal Education Program. In 1977, Governor Rudy Perpich appointed Wahl to the Minnesota Supreme Court. Wahl's appointment was significant as she was the first woman jurist to sit on the state's highest court. While on the Supreme Court, Wahl served as its liaison to the Court's Study Commission on the Mentally Disabled and also chaired its task forces on gender fairness and racial bias. Wahl remained on the court for seventeen years until she retired in 1994 at the mandatory age of 70. A guide listing the resources at the MNHS library.